This site needs a major overhaul but may never happen. In the meantime I just add to it as I find things I want to store. I have added to this site since 2006 when I began working on my doctoral thesis while employed as a senior educational psychologist leading on an authority wide project I was passionate about. I wanted somewhere to keep things so I could find them (I am seriously untidy as you will realise should you have a look through the site). I also wanted to walk my own talk and offer my learning journey as a gift to anyone who might be able to benefit from meeting some of the inspirational people and ideas I have met along the way, and knowing something of my stumblings and fumblings in the forest of my ignorance and occassional moments in the glades of insight I have enjoyed. Many things have changed in my life since then. I have a doctorate. The funding for my work ended and with it my job. I am having to think again very carefully about my purpose in life. What is it makes life worth living? This picture sums it up. There is Ubuntu explained as 'I am because we are', I am also very interested in exploring 'we are because I am' - why is that so much more difficult? 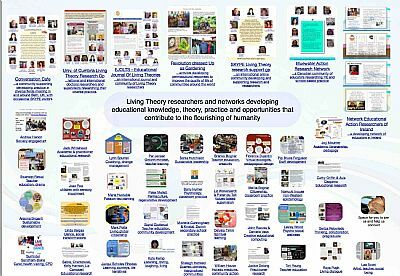 If you are looking for a gateway to a community of values driven practitioner researchers have a look at collection of living posters. Check them out, follow the links, contact people and contribute your own living poster. The contribution Cyril Rosen made to the world through his life and his work to make the world a better place for primates is one of my inspirations. Memory of him reminds me that, 'there is no unbinding the chain that a life lived with such integrity can bind around our hearts'. If you would like to let me know what, if anything, you find useful, thought provoking, irritating... anything you would donate to make the site more useful, I would much appreciate it. Contact me.